Today one of our network upgrade teams is in Aldie working on phase two of a three-phase project to improve broadband in the area. We were honored that Supervisor-Elect Tony Buffington stopped by to check in on our progress. Mr. Buffington understands the importance of improved Internet service and has been following our upgrades since the beginning of his campaign. After today’s upgrades are operational, network capacity in the Aldie area will increase ten-fold. Once the third phase of the upgrade is complete later this month, All Points will have increased network capacity fifty times. We will also be able to offer service to residents and businesses on the west side of town, where service was previously unable. Our support teams will be contacting existing customers who can now receive service on our upgraded network to schedule installations. 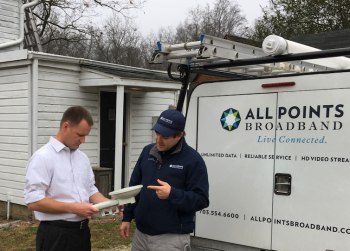 Other Aldie residents who want service should contact our sales team at sales@allpointsbroadband.com or 704-554-6600 (ext. 3). All Points Broadband is pleased to announce that the Virginia Information Technologies Agency (VITA) has selected All Points to provide fixed wireless broadband services to public bodies throughout Virginia. The award comes after a competitive procurement process, and allows state agencies, local governments, and certain public and private institutions of higher learning to order All Points’ commercial broadband services. The statewide offering is intended to provide connectivity for public facilities in remote locations that were previously not connected to the Internet, or connected with limited speeds or data allowances. All Points is authorized to begin accepting orders on the contract immediately, and it is expected that services will be available on the VITA zip code search tool later in December. Services on the contract are eligible for the federal e-rate program. Public bodies interested in service can contact business@allpointsbroadband.com to discuss service options.